Bailey is out of 4XGMPR HRCH Colorado's All that Jazz & 4XGMPR HRCH Golden Oak Red Rock Duke. I searched for several years to find this strong of pedigree to go along with the quality looks and performance I desired in a lab. 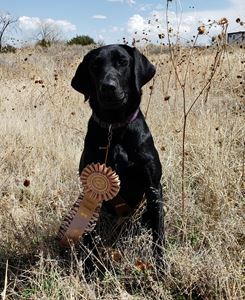 Like her parents Bailey has really excelled with upland, waterfowl and hunt tests. She is a very quick learner with an extreme desire to please. 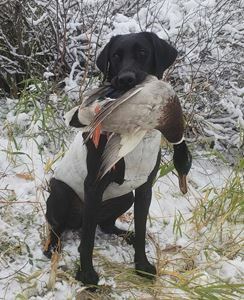 This makes her a dream to train and hunt with. As good as she is in the field she is even better in our home as a companion to my wife and I along with our 3 kids. 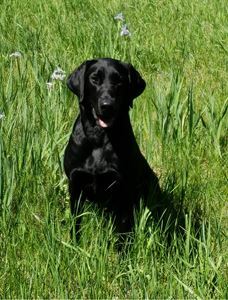 Guster and Bailey are both 100% amateur trained and handled by their respective owners. Guster is an APLA 4XGMPR and AKC MH. More information about Guster can be found on his APLA stud ad page. Additional information and pictures in regards to Bailey or Guster may be provided upon request. 1 Yellow Male, 3 Black Males, and 1 Black Female born on 4/11. Ready to go home on June 6th. Now taking deposits.